The Gun Rocks Leaflets Have Arrived! Today the Gun Rocks Leaflets arrived from the printers. 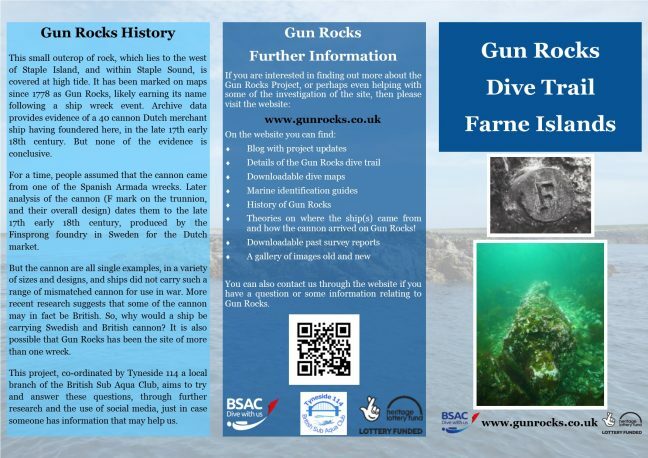 They are A4 trifold leaflets containing lots of information about Gun Rocks. The front page has a picture of the all important F from one of the cannon trunnions, and a picture of one of the cleaned cannons, just showing off its cascabel. The inside flap gives a brief summary of the Gun Rocks history, which wasn’t easy to summarise in to so few words! The inside of the leaflet is set out as an A4 spread, with a copy of the cannon map in the centre, surrounded by photographs and text. We couldn’t show the dive trail on the canon map because it hasn’t been installed yet; but what we hope is that the leaflet will direct people towards this website, where they can download the most up to date version of the map and find out more information about the project. That’s the purpose of the back page of the leaflet. It is centred around Gun Rocks Further Information and what the reader can expect to find on the website. A QR code has even been added to aid in finding the website! The next print run will be of the marine critter ID leaflet hopefully. Then we intend to install the dive trail in mid April. As soon as the dive trail is in, we can update the dive trail map and put a downloadable PDF on the website.